My topic title is clunky but what I'm trying to understand is how 1 stop of light is calculated in all the different measurements. I'm guessing there is a chart somewhere but I couldn't find anything that seemed reliable or that had any explanations to what the math was. What are the increments of one full stop for F-Stops is F2 to F2.8 is that one full stop and what are the stop increments before and after that and how are they calculated. What are the increments of one full stop for shutter speed do you just double it? 1/50 to 1/100 is that one stop? What are the increments of one full stop for ISO/ASA is 100 to 200 one stop? is 160 to 320 one stop? do you just double this as well? I searched the forums but the search function didn't turn up what I was looking for. If this is already discussed can you please point me in the right direction. If you can find a copy of the American Cinematographer Manual, it's even better as it will give you all the calculations and also FPS and shutter angle stuff. Exactly what I was looking for. Thank you so much! Basically, an f stop is related to the diameter of your aperture (or entrance pupil), whereas exposure is determined by the area of the aperture. The relationship between diameter and area boils down to a factor of √2, so the f stop sequence is a geometric series where each number is √2 times the previous one, but indicates 2 times the amount of light. ASA/ISO is a linear scale where double the number indicates a doubling of light sensitivity. 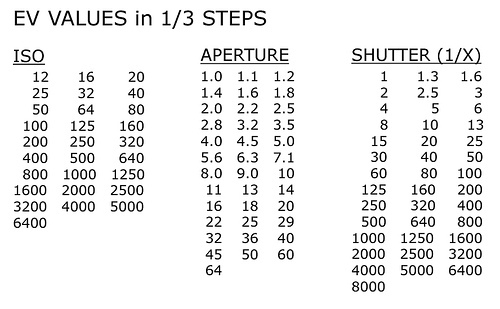 Similarly, shutter speed is a linear scale where doubling the exposure time doubles the amount of light. I have this picture saved on my phone for quick reference! It's perfect. Many other charts only have whole and halves, while I use thirds to help with figuring out the exposure on my BMPCC with a speedbooster.